The last thing anyone wants once out on the Camino de Santiago is to have problems with accommodation, especially after a long day’s walking when arriving in to a town tired and weary. We’ve listed some of the most common problems with accommodation and provided you with the solutions to help your trip go as smoothly as possible. 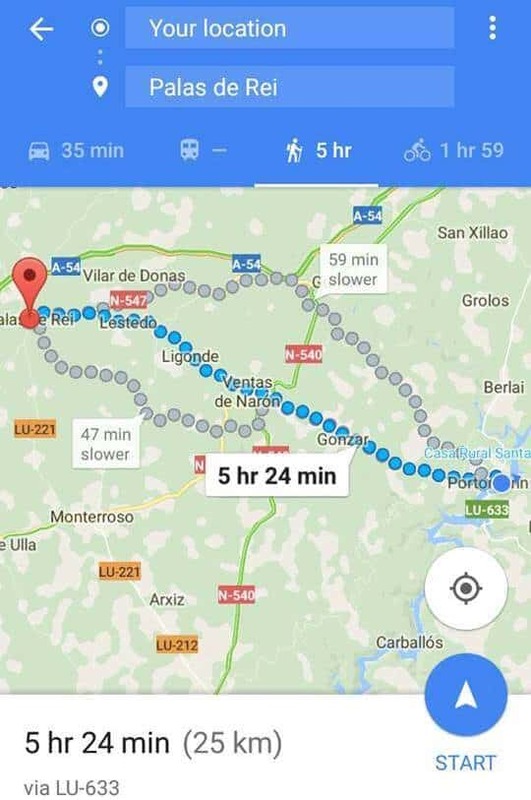 While you walk the Camino, you will have to make it to your accommodation. These are in towns you have never been in, in a country you are probably not very familiar with. So depending on how you made your booking. Booking engine platforms, directly with the hotel etc. If you book with an agency they will give you various level of information. You should expect the address details as well as individual maps for each accommodation and these are delivered in one document in your itinerary so that you do not have to check through many emails to check daily your next stop. Once you have these documents, have at least the day’s destination with you every day and follow the instructions and look for landmarks on the map such as train / bus stations, churches, squares etc. Then instead of trying to navigate, it may be easier to just ask people once you get near enough. It is usually quicker (locals know where things are in their own towns) it also allows you to engage with them and maybe ask for a nice place to eat in later on. Now here is when you should take a breath and play it smart. Make sure you give your name as per the person who made the booking in the first place (let’s call him/her The Group Leader). Indeed if you are part of a party of two or more, accommodations usually only take one name on their reservation notebook – even if you gave them all the names at the time of your booking. The same way “English” speakers mix Santiago de Compostela with San Diego de Compostella (yes we do! ), Spanish can struggle a bit withexotic names Siabhon O’Riordan, Fintan O’Callaghan or other Seamus O’Keeffe. So, writing your name down is a good idea. Also give your booking date and the way you booked (agency name, booking platform or your email address) to help them find your booking as any of the mentioned forms of booking will send an email request and get confirmation from the accommodation before confirming with you. Rooms are being cleaned usually as soon as guests leave the hotel (check out) when the keys come back to reception. However there are check out times that are more popular than others and the cleaning of rooms then will take turns. All rooms are usually ready by 10 or 11am, although some are from 2pm (late check out). So if you have started early today or have walked faster than you thought and get to your destination early, your room might not be ready yet. There are a couple of options for you. Go for a coffee, lunch or explore the town centre and surroundings. Make sure you ask the receptionist to give you a clear idea of when the room will be ready. Alternatively, ask the person if they have another room ready as it is possible to swap for the same types of rooms in most cases. More and more people use the luggage transfer service. This service of convenience is great to allow you to walk light, manage tiredness and strain on the body. The logistic of the luggage transfer is a simple yet complex system but they usually deliver by 2pm. So if your luggage has not arrived yet, do not panic. It is usually on its way. If you are aware of the name of the transporter, you can contact them or ask the receptionist to help you with that. If you used an agency, they hopefully supplied you with a service emergency number. So you can check with them. Getting in contact with the transporter can take a few minutes as they are driving and cannot attend some phone calls right away. They should be able to let you know within 10 minutes an estimated time for your delivery. If the driver does not have your luggage, DON’T PANIC. Ring the hotel you checked out from that day and check if your luggage is still there. If so, you need to organise a new transfer and manage a refund with the contracted company for the service that was not delivered. If the luggage is no longer in the hotel you checked out from, you are in the worst of storm in the luggage transfer scenario. Again DON’T PANIC. 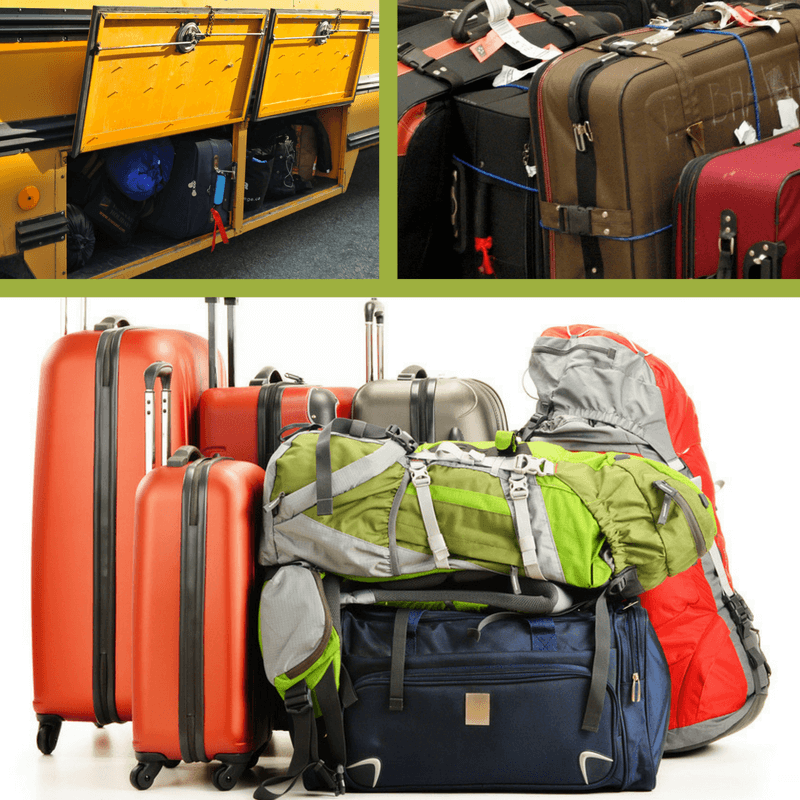 In the morning, accommodation receptions can be full of bags, suitcases and might be transported by different transporters. Sometimes – rarely, a transporter might inadvertently take your bag as part of a pile of bags that belong to them. Here there is no magic formula but be patient. Usually the bag will reappear around 7pm when your bag will have been brought with another bunch to another hotel. Then the receptionist will identify the bag as not belonging to their accommodation and start the search for the owner. Your operator will help you deal with this. If the room you are in is not to your taste, there can be solutions or not. It all depends on what the issue is and where you are. The Camino is an adventure in itself as whether you are going for a 5 days walk or 35+ from St Jean to Santiago, you will be moving every day, going from town to villages to cities. The standard of service varies and you will not be able to have 3* freshly renovated every day. I would recommend you to deal with the accommodation owner to find a satisfactory resolution. It is not for nothing that accommodation owners are called in Spanish: Hospitalleros (hospitalyer). Most of them want to welcome people and treat them well with what they have whether the hostel or simple 1 star pension to the Parador Hotel type of accommodation. Depending on the nature of the problem, they might change your room which is the best case scenario for you. Alternatively, they might give you a “sorry” drink or dinner. Hotels benefit from their surroundings. Usually in a good way (great location, cheap, by the sea etc.). Although, sometimes for example if a roadwork is being carried out a hotel cannot close for the period of the work hence, work legislation being strict with specific and limited start time 8am to 5pm. If you are staying in hostels, this will surely happen with pilgrims unpacking, snoring etc. In other types of accommodations, it may happen that during your stay, a wedding is taking place or a feria (village party). While we all like our quiet nights and resting sleep remember, that you are traveling through people leaving places. As such it is important to respect the local life and livelihood. That is when the ear plugs come handy. Once you have used the room and or meal you should not expect compensation to a value higher than the price of the services. You arrive to your room and although you had booked a double bed room, you are given a twin. Unlike in the USA, on the old continent, rooms are not all fitted will 2 double beds. Hotels tend to have only 15% of double bed rooms and a small portion of single rooms too so most of the rooms are twin with 2 single beds. While they might not be the best for couples, hotels prefer these to have more rooms able to respond to any type of bookings even joining 2 single beds when clients have booked a double bed room which accommodation take as fulfilling their contract (CHECK THE LAW). It is no harm to ask for a real double bed if that is what your confirmation states. It is up to you on how you take this knowing that this type of behaviour is very common on the hotel side, it is the best way to manage their properties. On the client’s side, it is not always ideal so speak out before you use the room and try and find a reasonable outcome. Booking contracts vary greatly from accommodation to accommodation and from operator to booking engine. Some hotels are paid before the stay, some on check in, some on check out and some other after client’s departure. Because accommodation owners own are not tied to any hotel chain contract and policy, they kind of do what they want and feel most comfortable with. You will find that in France they tend to ask for payment upfront (deposit at the time of booking and balance on arrival or check out) while in Spain and Portugal they tend to get paid at check out. So if on your arrival, they are asking for payment, if you have booked via an online booking platform, check your confirmation email. If you have booked yourself, same thing and if you have booked via an agency, just ask the hotel to ring the agency to sort it out. It is a good idea to remind your host of your meal preferences if you are vegetarian or lactose intolerant etc. Even if you requested this at the time of booking, be aware that between that time and your arrival, a lot of time has passed and the receptionist might have changed, the chef too or they might simply have forgotten. Remember that you are not going to go through a chain of hotels with bullet proof booking system, line managers etc. in a lot of smaller places you are dealing with family owned business which don’t meet the standard of service of the Hiltons. But, you know what this is partly why the Camino is appealing. So to prevent any issue at dinner by clarifying it when you check in and toyour waiter as well (he/she might be different that the person who checked you in). Do speak out nicely, it is the best way to get what you want. Depending on what part of the Camino you are walking, meal times may vary. In France, breakfast is around 7am to 9am, In Spain, 7:30am to 10am, in Portugal 7:30am to 9:30am. If the time does not suit you, it is unlikely they will get the cook earlier or later for you. They are usually accommodating and can prepare a picnic breakfast for example, if you are leaving early in the morning.